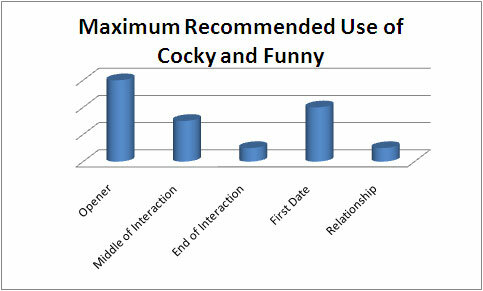 Cocky and funny is a concept that was originally introduced by David DeAngelo in one of his books, Double Your Dating. David noticed through trial and error that one of the most effective ways of sparking attraction early on in an interaction is to say something that is funny with a hint of cockyness. Although this is only one of the many techniques that he teaches, this is probably the most popular one simply because it’s easy and effective to do. Just mix three parts funny with one part cocky and you have a recipe for attraction. The trick when using cocky and funny statements is that you have to get the balance just right. If you’re too funny, you’ll end up looking like a clown. However, if you’re too cocky, then you’re going come off as arrogant. Finding the right balance between the two is really the key to using this technique, and that’s what most guys will fail to mention. You’ll know you’re getting it right because she’ll be laughing and smiling at the same time. If she gently touches you on the arm as well, then that’s even better and you’re definitely on the right track. If you plan on trying this out, then I recommend you think of the cocky and funny technique as a spice and only apply it very lightly. It’s very easy to overdo it by using it too frequently which results in the woman losing interest. Don’t over-do it! The best time to use a cocky and funny statement is within the first 5 minutes of meeting her. In the attraction phase, if used properly, it will be a great way of letting her know that you’re confident and funny at the same time. In my experience, the most effective use of these statements is when it’s least expected. If you can catch people off-guard with a hilarious and slightly cocky statement, they’ll be laughing and smiling at the same time. However, as a general rule of thumb, don’t use more than 2 cocky/funny statements per interaction. If you’re doing it more than that, then you’re likely just going to come off as arrogant. Be PLAYFUL with women. Toy with them in a fun way (it’s all about being light and gentle). If you think about it being playful with a woman is a great way to find out if she’s interested. If she plays along with you then she has given you a positive indicators of interest. If she doesn’t then you need to change your approach. If you’re going to be using David DeAngelo’s cocky and funny, use it as a spice and don’t overdo it. Even though it’s a great technique, it’s still only one piece of the puzzle. It’s when you put all the pieces of the puzzle together that you start getting phenomenal results with women. Hi i request some more cocky and funny approach to attract woman! Cool, I’ll be adding a few more examples shortly. In the meantime, here’s one that you can use as an opener. Sit down next to a girl in the subway and say: “Do you always sit beside the best looking guy in the subway?” with a big smile on your face!